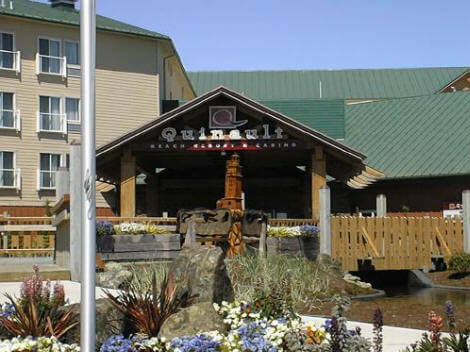 Quinault Beach Resort & Casino opened May 22, 2002. In 2016 the casino began a $25 million expansion project to enlarge the gaming floor, add a "smoke-free" playing area, a themed buffet and a circular bar. The new buffet and bar opened June 1, 2018. The expanded gaming floor opened June 22, 2018. See News Article. Guests under 21 are welcome at the nawitin Buffet but must be accompanied by an adult over 21. Ocean Lounge - open daily 8am to 2am. Ocean Lounge - live entertainment Fri and Sat 9pm - 1am. 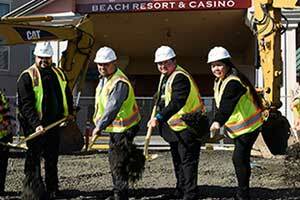 Quinault Beach Resort & Casino will hold the Grand Opening of its newly expanded casino and Vegas-style buffet June 22, 2018 at 3pm. The celebration concludes the two-year, 25 million-dollar expansion project. The new casino is currently open and accommodating 750 slot machines with new games, and includes a high stakes table area. The Quinault-themed buffet, and circular bar, open to the public on June 1, 2018. Don Kajans, General Manager of Quinault Beach Resort & Casino states "we are excited to be able to bring this expansion project to a close. The new casino and games are exciting and the buffet is like none other in the area." The expansion is projected to bring thousands of new visitors to the region and hundreds of new job opportunities. Quinault is one of the largest employers in the Grays Harbor; and they're currently hiring. The official ribbon cutting ceremony June 22, 2018 will include a traditional blessing and tour of the new facility. It coincides with Quinault Beach Resort and Casino's 18th Anniversary Celebration beginning June 15th with their Cooking the Blues extending through June 23rd with the William and Reese Comedy Show (Indian and the White Guy). Full details for the Grand Opening are available at quinaultbeachresort.com.